Purim is coming soon to the Shomrei kitchen in an unexpected way. As most of you know, every week we serve a hearty, multi-course meal for up to twenty guests from the Montclair Emergency Shelter for the Homeless (MESH) program. Shomrei cooks are nothing if not inventive. Working with a limited budget and often limited time, they turn out gourmet meals that everyone can enjoy. A couple of weeks ago, those creative cooks really let loose. 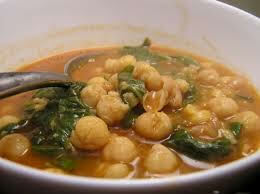 The featured dish was a hearty chickpea and spinach stew. It’s perfect for Purim. Lore says that since Esther was an observant Jew, she refused to eat most of what was served in Ahashuerus’s palace. So what did Esther eat? Most likely her diet consisted of fruits, nuts, legumes and, of course, chickpeas, an ingredient often featured in Middle Eastern cooking. She was supposed to have been especially fond of poppy caraway seed pastries. Hamantashen, anyone? By the way, this diet not only fulfilled Esther’s kashrut requirements, it also said to promote beautiful, healthy skin. No wonder Esther was such a beauty. So, if you are ever asked about beautiful Queen Esther’s diet, you now know the answer. 1. Wash spinach and cook in liquid adhering to the leaves over high heat, tossing frequently (add a small amount of water if needed). This takes about 2 minutes. Drain & press out excess moisture. Chop coarsely. 2. Mash garlic with a small amount of salt. Add paprika, cumin, cloves, & pepper. Mash/mix to combine. Stir in ¼ cup of reserved chickpea liquid. 3. Add oil to pot. Add onion & tomato; cook over moderately high heat, stirring occasionally, until softened. This takes 3-5 minutes. (If using canned tomatoes, cook onion & then add tomatoes for a minute) Add the garlic sauce and cook for another minute. 4. Add chickpeas with liquid & raisins. Bring to boil over moderately high heat. Add spinach, reduce heat, and simmer 15 minutes. 5. Adjust seasoning to taste. 6. Serve on a bed of couscous or orzo; garnish with Greek yogurt mixed with zumac powder or a combination of garlic, fresh mint and salt. Notes: This recipe is very forgiving. Chopping spinach is not essential. Peeling and seeding tomatoes is not necessary. Use more or less of ingredients to taste. May also be mixed with orzo for a thicker consistency. Turkish pita bread (different from pita bread) is a good accompaniment.